During the fifteen years that I have been a patient of Dr. Sherman, she has carried out procedures ranging from simple fillings to complicated root canals and bridge preparations. In each case, these were done with extraordinary skill and great concern for my comfort. Moreover, her support staff, the receptionists and assistants know who I am and take care of my concerns both warmly and efficiently.She is, quite simply, my idea of what a great dentist should be. I’ve been seeing Diane and her fantastic team for 20 years. They do a fabulous job of helping me maintain my health/teeth and have been there for me when I experienced a couple of urgent situations over the years. 5 stars +. I have had a LOT of dental work over the course of my life and I can say, without reservation, that Dr. Sherman and her staff have provided superior care for me. 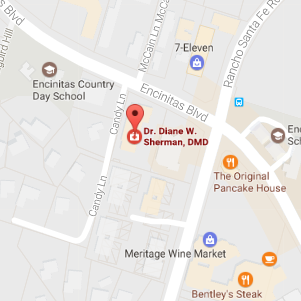 Dr. Sherman oversaw my three dental implants and I have amazing results. I heartily recommend her!